If we are trying to communicate with spirits then why not try to talk to them in the same manner they speak with us. The “ES” energy speaker takes our voice and broadcast it in electromagnetic frequencies instead of audible frequencies. The ES is a product made by Digital Dowsing and designed specifically for this use. Once hooked up to the output of your voice recorder it will broadcast whatever you are playing back as EMF that you can see or measure with a EMF detector. 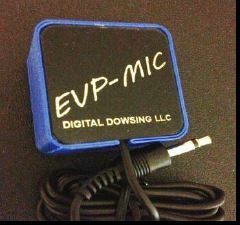 The second device is called the EVP microphone and it’s an inductive pick up that only picks up electromagnetic fields. This microphone plugs into your voice recorder and records EMF only, no other sounds or ambient noises are heard. If a spirit was to try and communicate using EMF we would then hear that voice. By playing a prerecorded voice thru the “ES” Energy speaker and setting up a second recorder with the EVP Mic then we should be able to hear our prerecorded questions and possibly any responses. Although I have not been able to use these 2 devices I am hopefull that I will have them in my hands and ready to experiment with them in the next month or two. Once I have I will let you know what my results were and how well they performed.